First, let me tell you that the word tramp to someone in Holland has a far different connotation that it does in America. A tramp was a person who traveled around looking for food and employment. The word is kin to hobo or bum. I think this would be the Dutch version of how Brennan Manning referred to himself as a "ragamuffin." She did this because she traveled far and wide after the war seeking to serve God in whatever way she possibly could. I read Corrie's first book, The Hiding Place, in eight grade and her experiences during the Holocaust have spoken to me since. That story led me to start reading her other numerous works. I think without reading these other books I would have assumed that her story was all about what happened to her in the concentration camp. Reading My Father's House, my eyes were opened to the beauty that she displayed as she served God in amazing ways before the war. This book was no different. I am stirred and challenged by how she gave of herself after the war. She basically never had another home. Corrie lived as a traveler. 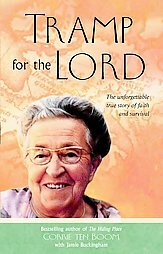 She flew all over the world sharing the message of the gospel and Christ's forgiveness. Many times she would get on a plane and go to a different country because she felt like God was leading her to do so. When she would arrive, she would meet someone to house her and, by divine appointment, end up speaking to dozens of groups. God supplied all of her needs on each leg of the journey. She did this until she was in her eighties. I was touched by her humility as she shared how she struggled with selfishness and had to be reminded to return to her first love many times. This testimony spoke deep into my life. I was touched to see this little glimpse back at her home before the war. It was a reminder to my heart that God has long been calling people to do what we are doing here at Gomer's House. Another encouragement I received was, even though I love to study Hebrew and Greek, to not worry about explaining or discussing the depths of word study or doctrine with people. Our job here is to simply remind others that Christ loves them deeply. The reality of Jesus Christ. I love it!